ThomasHow well is he representing us? "Fourth Ward Councilman Ian Thomas might have violated state law by using his city-provided email address to distribute a newsletter that denounced claims made by Proposition 2 opponents and solicited donations for a campaign committee supporting the measure," the Columbia Tribune reported. "Thomas said he was unaware of the restrictions in state law." Ten months later, Mr. Thomas apologized again. "For the second time in a year, Thomas used his city-provided email address to distribute a newsletter to constituents advocating for the passage of a ballot measure [a sales tax renewal] before an election," the Trib reported in 2015. "Thomas said it is not clear to him how using his city-sponsored email is a violation of the law because 'sending that email out did not cost the city any more money than it already did to set up the email account.'" The Missouri Ethics Commission dismissed a complaint against Thomas, while then-Trib owner Hank Waters -- known for his own ethical lapses -- dismssed the incident as "Ian's gaffe." "A few local Thomas detractors have tried to make something of it, alleging the Councilman surely knew what he was doing...grumble, grumble...but that’s an empty accusation," Waters wrote in an editorial. After calling out Columbia police officers for using excessive force with minorities, Mr. Thomas apologized for a third time after statistics failed to prove the charge. Police representatives called the Councilman's 2018 remarks “careless, inaccurate and inflammatory." Apology number four offered contrition for Mr. Thomas's role in a vote-selling scheme for which the state Attorney General and Boone County Sheriff are now investigating him. After city legal counsel advised a deal he was trying to make with Oakland Crossings developers Shannon Sapp and Justin Barnes may violate state law, Mr. Thomas reported himself to the Missouri Ethics Commission. The 3-term Councilman promised to vote for the development and champion it at City Hall if Sapp and Barnes gave $40,000 to the Columbia Community Land Trust, which sells homes while keeping the land beneath them. Ignorance of the law is a hard sell, especially for a politician of Mr. Thomas' intellectual caliber. He holds a Ph.D. in physics and frequently interrogates city staff in academic fashion, peering over his spectacles and speaking in a righteous British baritone. To casual observers, Mr. Thomas is known as the Pednet guy and son-in-law of beloved former Columbia Mayor Darwin Hindman. To diehard supporters, he is a man of the people who takes on development interests and stared down a "Chamber of Commerce candidate" with his own ethical flaws, former City Councilman Daryl Dudley. But casting Mr. Thomas as The People's representative seems misguided. He unfailingly keeps his own counsel, prefacing almost every policy position with "I think, I want, I will," and "In my opinion." Like his father-in-law, Mr. Thomas separates constituents into two types: those with "respectable credentials" earned by towing the line; and those without. 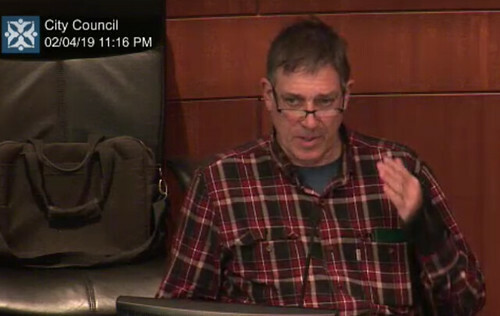 Mayor Hindman likewise coined the phrase "civically obsessed" to describe community activists whose frequent appearances before the City Council substitute for lack of funds to hire lawyers or lobbyists. In another email, Mr. Thomas facetiously challenged acting city manager John Glascock to guess the identity of retired city public works supervisor Bill Weitkemper based on a question he had asked. That question, Mr. Thomas implied, had typecast Weitkemper as a community crank obsessed over a single issue. Mr. Thomas won't salute the American flag; doesn't listen to people he considers his inferiors; and bends ethics rules toward his own priorities, or ironically, the priorities of the same powerful developers he has publicly opposed. Those asking "should Mr. Thomas resign" should also ask, "How well is he representing us?"